ancient malt and ale : where have all the malting floors gone? 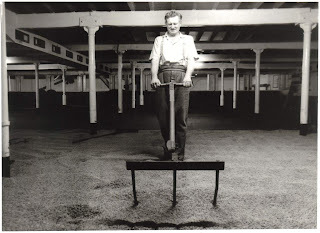 I was very interested to read your excellent article about the loss of Maltings in the Uk . 22 - 24 Hallgate Hexham Northumberland houses the art gallery and art materials shop ‘Haslam’s of Hallgate’. The early C19 row of buildings flanks Hall Orchard, one of the ancient approaches into the centre of Hexham. Although an interesting enough building from the outside, its real secret lies beneath - the stone exterior hiding an unusual history recently unearthed by owner Ben Haslam. By the mid C18 this expensively constructed structure was becoming obsolete as larger scale malting houses began to dominate production in the region, as brewers began to buy malted barley directly from bigger malted barley handlers. It is thought that the building became increasingly subterranean as ground levels rose to accommodate drains and sewers that were laid parallel to the building in the 1800s. The current building now standing over the vault, and now an Art Gallery and flats, was constructed early 19th Century and by the 1830’s the vault had become a storage cellar used by merchants a Hexham family John Miller and Sons for conditioning and the wholesale distribution of Ales , Wines and Porters . The business was sold and became abandoned by Scottish and Newcastle in the late 1960’s. Artist Ben Haslam is the current owner and has restored the cellars with great care and attention. The beautiful stone construction, has been cleaned and restored all by hand using local craftsmen. The Vault is now used as an Alternative Arts venue for the enjoyment of music and performance. Thank you. The detail which you have published here is useful for me. You can check out the designer collection of basement flooring in reasonable amount.